Thank you Erica and Francesco! Once again you created an experience of a lifetime for me- one that I will draw on for comfort and joy and reflection while I deal with the stresses, trials, and tribulations of work life. Africa has a special place in my heart... I loved how I got to witness the circle of life and most importantly how we ALL are a part of a greater whole and connected on multiple levels. The icing of your trips are all the wonderful souls I get to meet and connect with. Thank you. Yoga. Meditation. Fitness Training. Massage. Fresh, local, creative, flavorful cuisine- with a variety of delicious choices to satisfy every palette. While you might be reluctant to come in from the awe-inspiring game drives, the delicious cuisine is definitely worth returning 'home' to. Vegan or gluten free? We've got you covered. This is a truly elegant, beautiful, authentic Out Of Africa mobile safari experience, with lovely private tented accommodations, delicious food & expert guides. 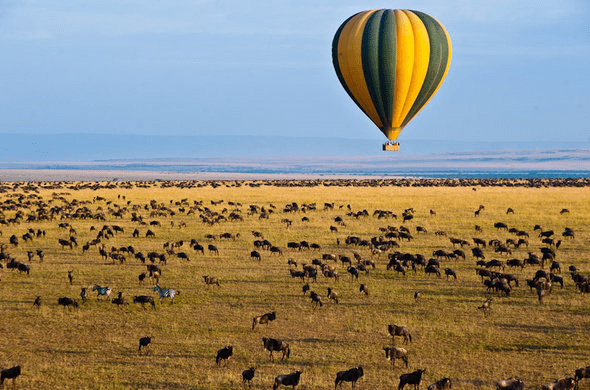 If experiencing a classic safari in the most authentic, elegent of ways is on your Bucket List, this Escape is for you! Join us as we support Pack For A Purpose. Bring items to donate with you and we will arrange for them to be picked up at in Arusha and distributed through the proper channels to those that are in need in Tanzania. Bucket List Escape + Epic Escape + Ultimate Escape all wrapped up in a perfect package - complimented by the unique and unpredictible performance that Mother Nature puts on daily. There truly are no words to sum up the experience that awaits. The Great Migration is often referred to as The Ultimate Safari Experience- dramatic, raw, real & impactful as the predators and prey live out a daily battle of life and death amidst the greatest diversity of wildlife, in a setting unsurpassed in any big game country in Africa. 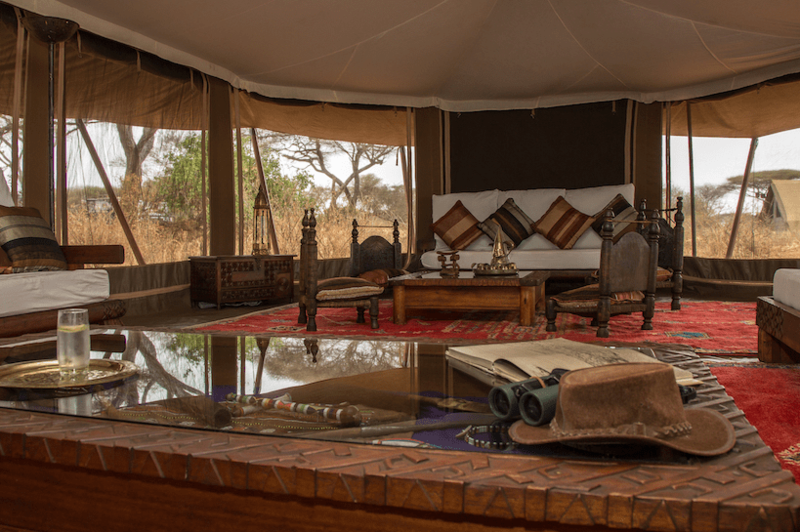 We invite you to join us at two of East Africa's most luxurious mobile tented camps for an experience that is sure to stay with you forever. 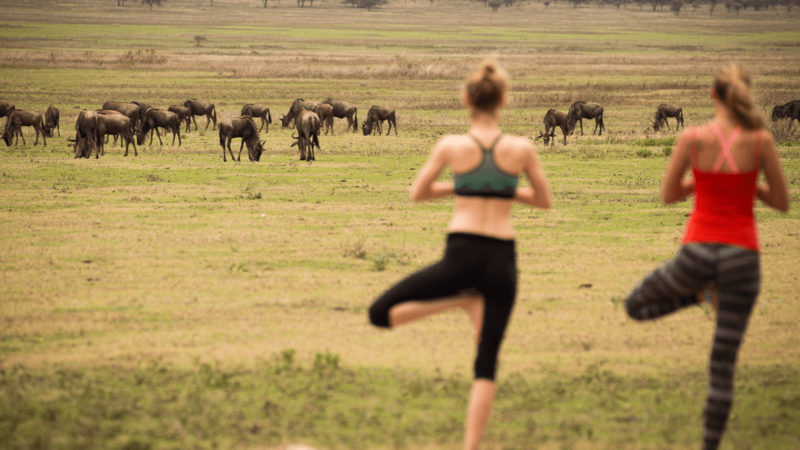 Twice daily private game drives, yoga + meditation & fitness classes, delicious meals prepared by our private chefs, served by our impeccable staff; sundowners & picnics, a hot air balloon ride, massage plus so much more. 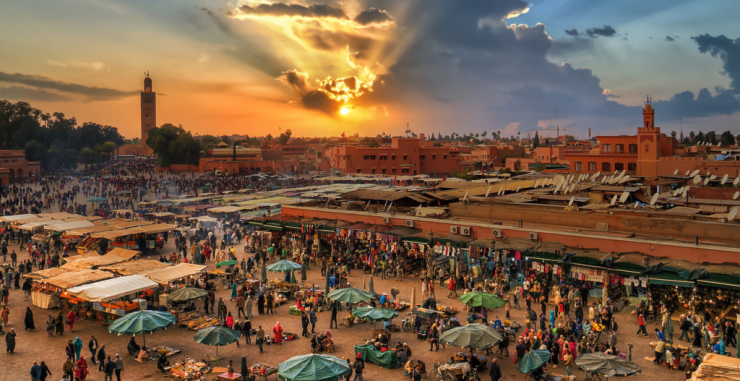 This is a truly elegant, beautiful, authentic Out Of Africa experience, with lovely accommodations, delicious food & expert guides, but as we will be staying in mobile camps, it is not for everyone. Please read all details below in order to decide if this once-in-a-lifetime experience is for you. 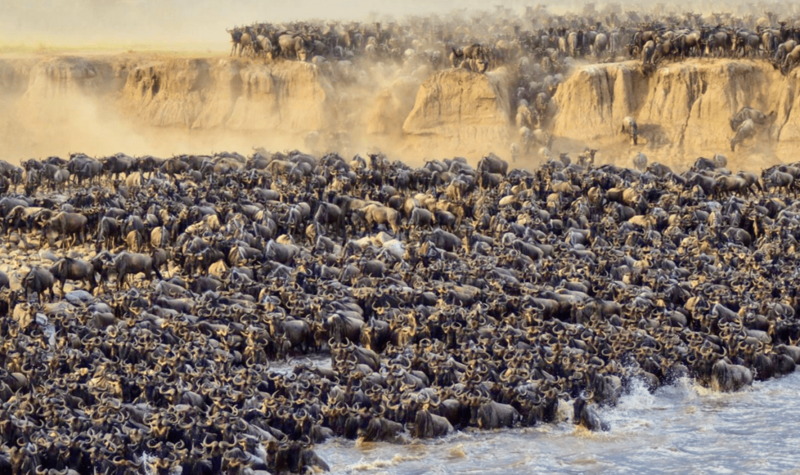 - The Serengeti camp changes at least three times per year to keep up with the herds of migration, taking over a week to break down, move to another location and build up again. The camp is not permanent in anyway and the site is returned to its natural state each time the tents are removed. - There are 8 tents available for a maximum of 16 guests. Each guest is guaranteed a window seat on each game drive. - Each tent has an en-suite bathroom partition which features a toilet, bucket shower and vanity. The bucket shower is filled on request with 20 liters of warm water that is heated over a fire and lasts approximately 3 to 5 minutes. - July in Tanzania is the dry season. Average temperature is 73-77 degrees during the day; 54-57 degrees early morning & evenings. There is no air conditioning or fans in the rooms. July is considered a cool month. - There is no place to charge phones or plug in a hair dryer in the tents. There are electrical outlets for charging phones & cameras in the main tent area. Hair dryers are not permitted. - Please plan to be OFF THE GRID for the entire time of your safari experience. Cell service is extremely limited & there is no wifi. Emergency contact numbers will be provided & a satellite phone will be available for emergencies. - Mosquitoes are not a big concern this time of year, but it is a malaria zone so best to discuss with your doctor directly. 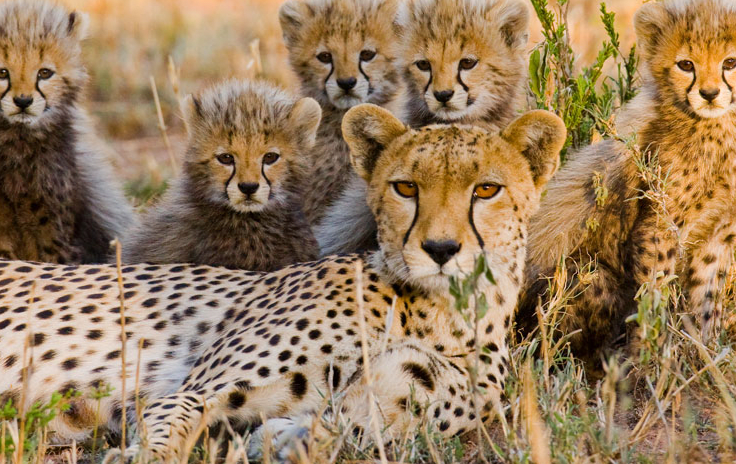 We will be in the Serengeti National Park North Corridor & Tarangire National Park. 3 delicious + healthy meals + snacks; beverages, including local spirits & South African wines, while at our private camps. $5000 non-refundable deposit per person. Please refer to the policies page of our website for our complete cancellation policy. The name Olerai originates from the Masai word for the Yellow Barked Acacia trees that are prevalent on the grounds of the lodge, casting a dappled light over the 8 acres of land on the outskirts of Arusha City. Once a private home, Olerai welcomes us with an air of calmness- an Urban Oasis, perfect for starting our safari adventure. Their philosophy is 'simple-exclusivity is the greatest luxury,' and, as such, we will have the entire property just for ourselves- just like with all of the safari camps. 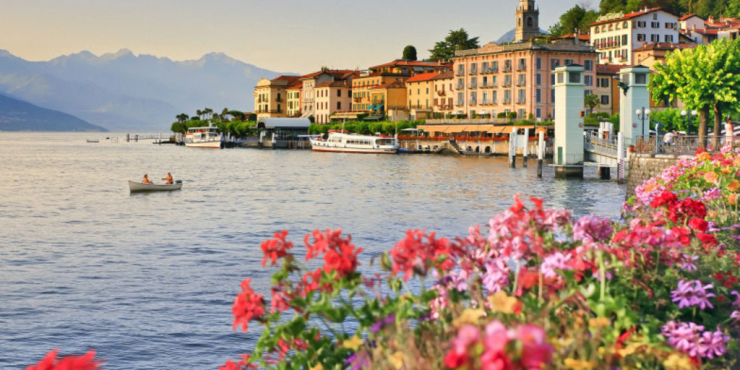 The small team of dedicated staff are there to provide personalized service in a relaxed, home setting. Ensuite rooms spread over the garden grounds provide comfortable accommodation, while lush gardens will serve as the perfect backdrop for our meals on the veranda. 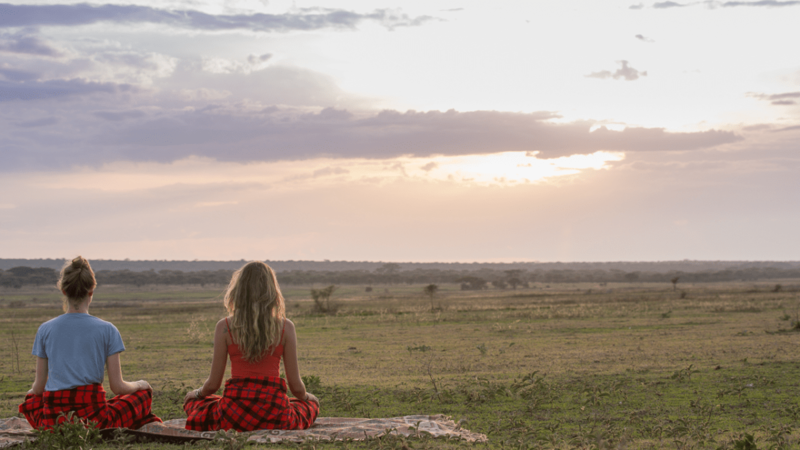 Osunyai Lamarkau sits facing the rising sun on the edge of the wilderness zone, affording stunning game viewing by 4WD or on foot accompanied by an armed Ranger. 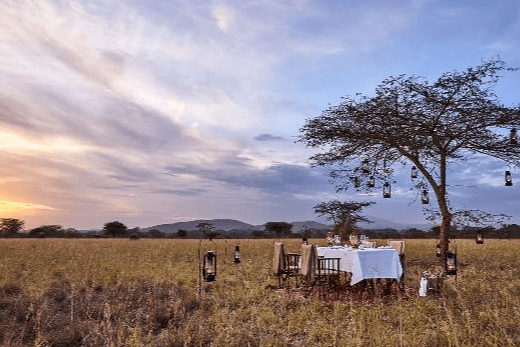 Due to the location of Osunyai Lamarkau and the sunrise setting, the camp affords a glimpse of true exclusivity- the last true luxury in travel. It's unique location on the edge of the wilderness zone within Tarangire- far from the main circuit- makes Osunyai Lamarkau the most remote & exclusive of any accommodations within the park. 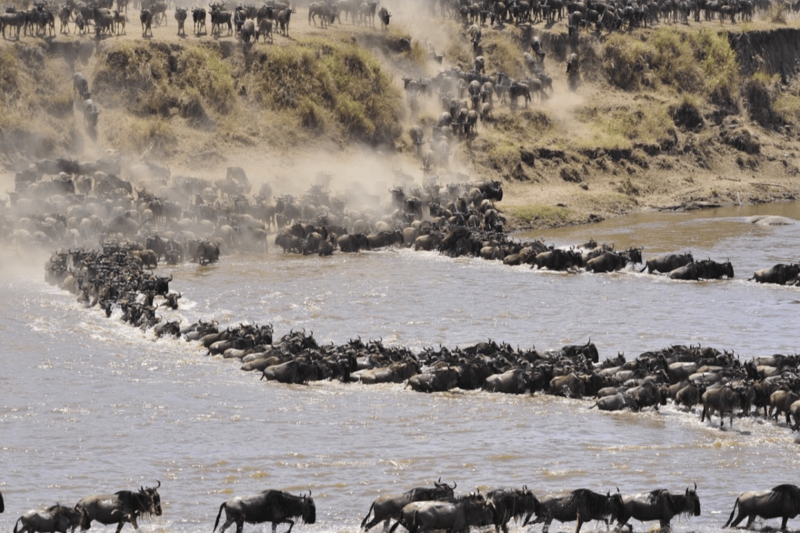 Sitting in the very north of the Serengeti National Park, Akiba Kibwe lies directly in the route of the migrating wildebeest and zebra as they head towards the Mara River. The river creates an exciting backdrop and alternative wildlife haven to the surrounding short grass plains and kopje systems that dot the valleys of the north. 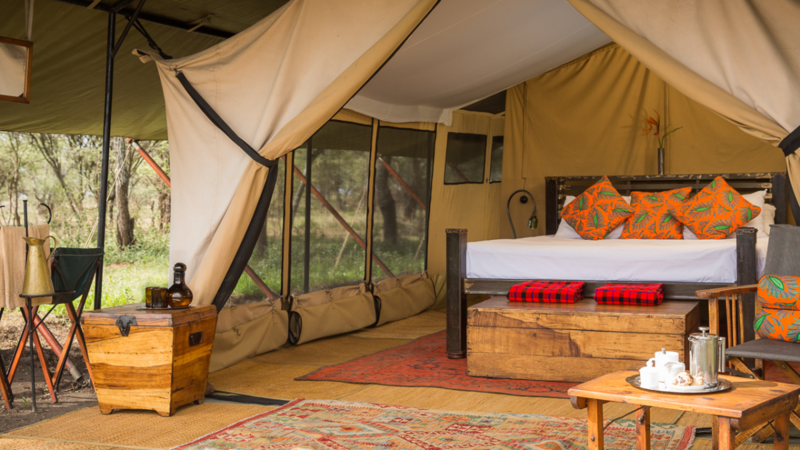 Akiba Kibwe, with its westerly setting, epitomizes the true spirit of an authentic, elegant safari experience under canvas. 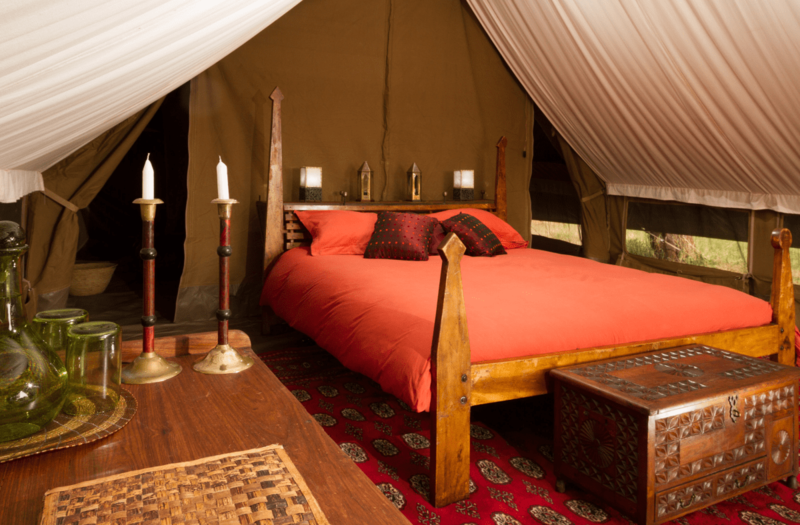 Each tent offers uninterrupted views west, situated to maximize the classic African landscape. Dining and relaxing are well taken care of in the separate tents with their billowing fabrics rippling in the African breeze. Each tent in both locations has an en-suite bathroom with a bucket shower (part of the adventure). 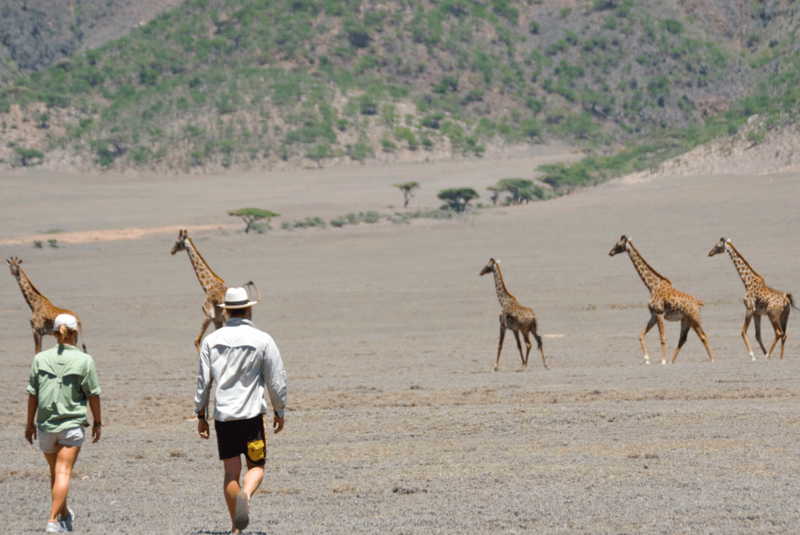 This is a wonderful way to experience an authentic safari, inspired by the early explorers on their first expeditions to this beautiful part of East Africa. Andrea Maltzer has been instructing movement classes for over 30 years . She completed her first Yoga Teacher Training in 2000 at It’s Yoga in San Francisco. She then travelled to Mysore India to study with Pattabhi Jois. After returning to San Francisco she began studying with Rusty Wells who is her primary teacher today. She teaches Bhakti Flow Yoga, This practice is a dance-filled prayer. A meditation in motion and a path to connect with the Divine. Additionally, Andrea also teaches Yin Yoga & meditation. Andrea uses an eclectic playlist as a backdrop to support the practice and guide students through a fun, challenging, and heart opening class.